Investigation: What Organisms Are Found in Pound Water? Investigation: What Organisms Are Found in Ponds? Does your community have ponds, streams, or lakes? Students enjoy working with real biology, and though it may not be possible to take students to a lake, you can bring the lake to the student. This open-ended activity gives students the opportunity to explore pond water and compare the types of species found in two separate samples. They can propose reasons why one sample of water might contain different species and differing levels of diversity, such as location, temperature, or human impacts. Each pond represents an ecosystem, so this investigation is a good beginning or end to an ecology unit. 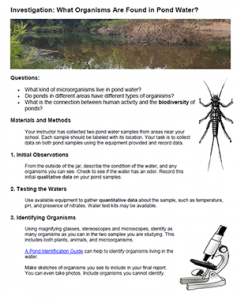 A pond identification guide can be printed, or you can provide field guides to help students identify organisms. This macroinvertebrate field guide can be printed and laminated for multiple uses. Students do not need to correctly identify each organism they see, and in many cases, unless you are an expert in limnology, you won’t be able to determine every creature that might be swimming in the sample. Most ponds will contain macroinvertebrates, like beetles and nymphs, as well as microinvertebrates and protozoa. Microscopes and stereoscopes can be used to looking at microbes that are not visible with the unaided eye. Depending on where you live, you might find amoeba, paramecium, daphnia, tardigrades and even flatworms. The activity requires students to create a table to share data and sketches and to present their findings as a lab report or infographic. Rubric for grading is included.